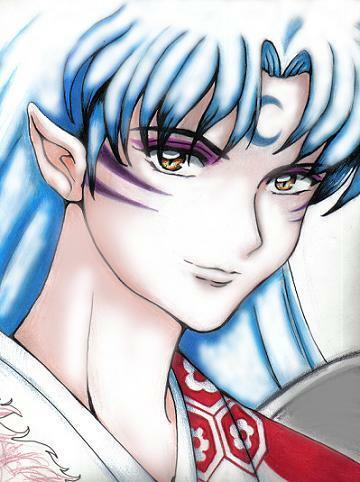 Home » Tamoko_Sanjii » Pictures » Sesshoumaru Is Colored! This was the kind of picture that took 5 minutes to sketch but FOREVER to color! The original was done in colored pencil and his hair was godawful really dark...so I went in and added some highlights where I could to soften the look up a little...Ahhh! I don't often use paintshop...Please excuse my messiness! I hope you guys like it...I thought I should put more color stuff up! *Added to favs before even commenting* Wowie! Sesshy ish smexy! O.O*tear* such a good picture. I LOVE YOUR PIC!!! IT IS AWESOME!!!!! AWESOME AWESOME AWESOME AWESOME!!!!!!!! ^-^ YOU ROCK!!! 0_0 Wow that is extremly good! What kind of colored pecils did you use, if you don't mind me asking? Extremly good pic!